Why would you need a 10-20mm zoom lens? Well, because it offers a really ultra-wide-angle of view that you just can’t get using the lens that came with your camera because its angle of view is wider than the eye can see. Many DSLR cameras come with a lens such as an 18-55mm, 18-140mm zoom or even 18-300mm zoom. These lenses are versatile but after shooting with one for a while you may find that you want to be able to capture a wider view of a scene than the lens will allow. Because this is a P series lens, when shooting video, its smooth stepping motor keeps focusing noise to a minimum. The AF-P DX NIKKOR 10-20mm f/4.5-5.6G VR lens can go as wide as a staggering 10mm angle of view. Images are incredibly sharp, even at the edges. Another feature of the lens is that it lets you get as close as 8.6 inches to your subject for dramatic looking photographs. This means you can get so close to your subject that it can fill the frame—looking larger than other objects in the background that may be the same size. The photographer placed the camera low to the ground in this shot, filling the foreground. 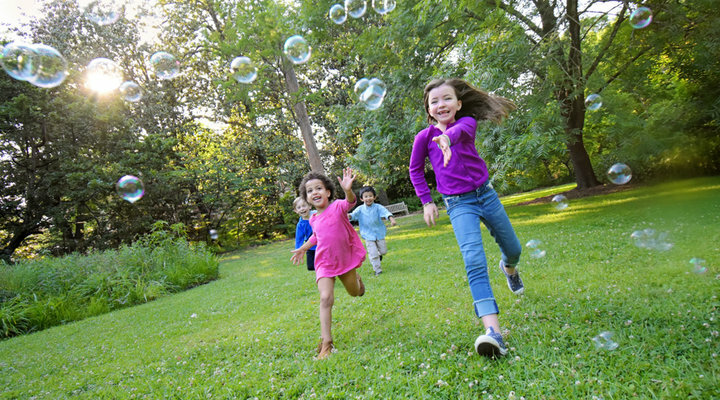 An ultra-wide angle lens lets you capture all of the action, and the surroundings, like these kids chasing after bubbles in the park. Tilt the lens down and include more of the foreground; tilt the lens up and fill the frame with the sky. You can exaggerate the perspective of buildings or straight lines in a scene by using the 10-20mm lens because it has such an wide field of view, meaning it can capture a lot more than the kit lens that came with your camera. Nikon’s Vibration Reduction (VR) is incorporated into this lens. VR is image stabilization, which will help you get sharp photos when you’re handholding the camera. A wide angle lens can cause tall buildings to converge at their peaks, which ads drama to the image. The AF-P DX NIKKOR 10-20mm f/4.5-5.6G VR lens allowed the photographer to get close to the edge of the cliff and also include the village on the far side. The viewer's eye follows the trail of light from the cars into the frame and around the street; into the background where the pinpoints of light and their reflections on the water bring you back to the foreground. If you love to travel and take pictures of sweeping landscapes or cityscapes then the 10-20mm lens might be what you’re looking for. An ultra-wide-angle lens is also ideal for taking pictures of large groups of people since they allow you to stay fairly close to the group yet still get everybody into the shot. Do you like taking photos of interiors? An ultra-wide-angle will let you capture an entire room in one shot and if the space is on the smaller size, you can make pictures that you otherwise would not be able to create with a longer focal length lens. Wide-angle lenses are often the choice of photojournalists because they can capture a subject in his/her environment and be able to tell as story with a single image. If you enjoy documenting the life around you, the 10-20mm zoom might be a good choice. A fun way to use the close focus capability of the 10-20mm lens is to get really close to a portion of your subject to the point that what is closest to the camera is exaggerated and looks larger than life. Depending upon what your subject is, this can simply put an emphasis on a portion of the image or make it look huge as compared to the rest of the subject. The AF-P DX NIKKOR 10-20mm f/4.5-5.6G VR lens will let you focus close to your subject to emphasize its importance in the photograph. For the avid travel, nature or landscape enthusiast, the AF-P DX NIKKOR 10-20mm f/4.5-5.6G VR is the ideal companion to your kit lens, allowing you to make unique photographs that the camera’s kit lens just can’t do. The boats in the foreground stand out as the main subject while the rest of the boats and buildings of the harbor fill the background. Photograph an entire building or interior room—whether the buildings are big or the rooms small. Photograph large groups of people. Remember though, not to place anyone right on the edges of the frame when zoomed out to 10mm to keep from distorting their bodies. Dramatic skies filled with clouds help to show just how vast this landscape is. Getting close to your subject places emphasis on what you want your viewer to focus on. Placing the horizon line in the top third of the image (where the trees meet the water) adds emphasis to the foreground.